Kullander, S. O., Karlsson, M. and Karlsson, M. (2012) Lepidiolamprologus kamambae, a new species of cichlid fish (Teleostei: Cichlidae) from Lake Tanganyika. Zootaxa, 3492: 30-48. Kullander, S. O., Norén, M., Karlsson, M. and Karlsson, M. (2014) Description of Neolamprologus timidus, new species, and review of N. furcifer from Lake Tanganyika (Teleostei: Cichlidae). 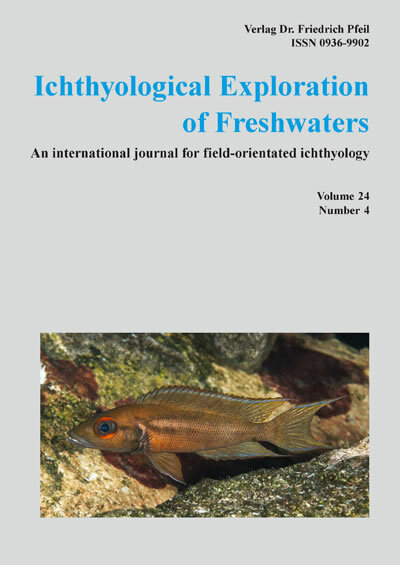 Ichthyological Explorations of Freshwaters, 24 (4): 301-328. Kullander, S. O., Karlsson, M., Karlsson, M. and Norén, M. (2014) Chalinochromis cyanophleps, a new species of cichlid fish (Teleostei: Cichlidae) from Lake Tanganyika. Zootaxa, 3790 (3): 425–438. Copyright © MMK AB Sweden. All rights reserved. Neolamprologus timidus at Mtosi, 5 m depth.